Wisdom of the Moon: Happy Thanksgiving from 1981! I've always loved those photos! 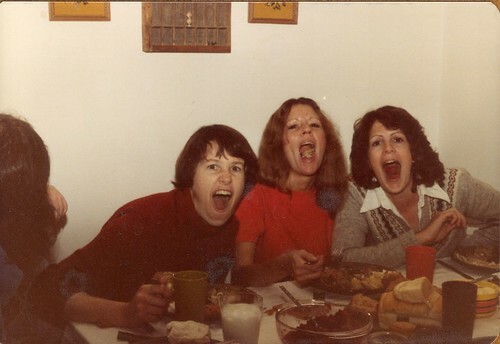 You know how shy I can be in groups, so to see evidence of those times when I actually participated in the fun with my two sisters-in-law is just too priceless to me (and makes me wish so much that we could ALL be together again). I'm thankful for those good memories, and for you sharing them. Happy Thanksgiving to all of you! Gosh, I was thinking we were in our mid-twenties in those photos, but I was actually 33! So we were all in the same age range of you and Jenny and Melody! Is it just me, or does that seem strange? I can hardly remember those days, unless or until I see a photo and the memories come rushing back. It's like those songs "You're Gonna Miss This" and "Blink" - you're so anxious to get older and to experience all there is to experience, and then it's gone in the blink of an eye. Isn't it funny how I make so many of your entries about me! Sorry! I'm sitting here crying my eyes out. 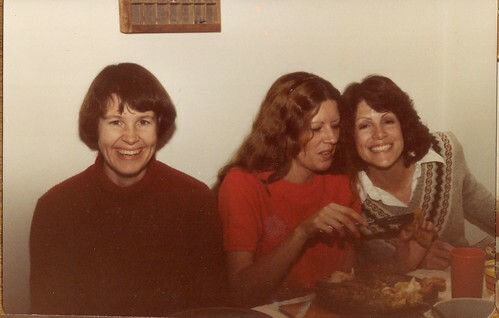 Like Linda, I've forgotten or neglected to remember so many of the good times. And, we did have such great, laugh until your stomach hurt times. Thank you, Wendy, for reminding me. FYI, we didn't get any of Granny's stuffing yesterday, so I'm going to have to make some, because Doug, Lindsay and I are all feeling very deprived. Yay! I love holidays from the 80s! Well, based on some of my posts lately, I apparently love lots of things from the 80s. Weird, the whole time I was IN the 80s, I thought it was lame. Ah, the memory, she's a whimsical thing.